PHÚ YÊN — Lobsters have died en masse recently in Xuân Đài Bay in Sông Cầu District, the central province of Phú Yên. 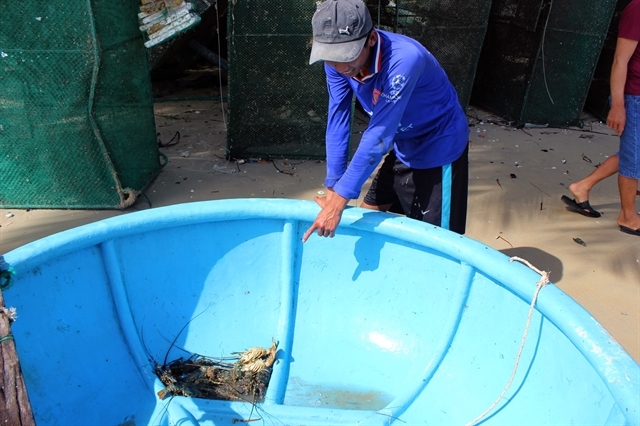 Sông Cầu Town has more than 2,300 households raising lobsters with nearly 66,800 cages, according to the town’s Economy Division. Water in raising ponds in the town recently turned red with Xuân Phương Commune suffering the most serious consequences. More than 2,100 lobsters weighing 0.4-0.6kg and 10,800 small lobsters of 27 households in the commune died. Lobsters in neighbouring communes also died, but in smaller quantities. Research by the Centre for Monitoring Aquaculture Environment and Diseases showed that the amount of poisonous air in the water was high whereas the amount of oxygen was low. The issue was blamed on the hot weather with sudden rain and strong winds. Nguyễn Văn Mười is one of the farmers who suffered serious losses. He said that 400 out of 460 lobsters died and he suffered losses of more than VNĐ110 million (US$4,700). The Phú Yên Department of Agriculture and Rural Development said that lobsters had died before in Xuân Đài Bay in 2016 and 2017. These instances were blamed on the rapid growth of seaweed. It is forecast hot weather will continue with heavy rains, thus seaweed will also grow quickly. Local residents should be vigilant to cope with abnormal weather. Nguyễn Trọng Hùng, director of the department, said that before the lobsters died en masse, the department had reported the poor quality of the water to the provincial people’s committee. However, several local farmers did not take preventive measures and suffered losses. The department asked concerned organisations to give local farmers guidance on preventive measures and move their cages to safer areas, said Hùng.